What Real Money Mobile Apps Are the Best? Can I play real money on my smartphone? Where can I find mobile online casinos? What games do mobile casinos offer? HTML 5 vs. download app – what makes more sense? Mobile and on the PC to play real money – where is the difference? What profit opportunities do I have? Play on the tablet or smartphone? Which Internet connection does my smartphone need? Numerous mobile casinos are available for smartphones, tablets and other devices, and players like you are no longer tied to a particular place — play where you’re comfortable or on the go. Mobile gaming is accessible from most mobile devices, and it doesn’t matter whether you connect via Wi-Fi or 4G. There are a number of ways to connect to mobile casinos. Some offer mobile websites you can connect to from any modern mobile web browser. Others provide casino-specific apps, such as PartyCasino, Mr Green, StarGames and Sunmaker. Casinos aim to support all devices but usually post a list that indicates requirements: operating system, hardware specifications and so forth. The bulk of apps are tailored to Apple and Android devices because these are the most popular. In the meantime, HTML5 has cropped up as an intriguing alternative because it lets mobile casinos be device-independent. Imagine a casino that supports BlackBerry phones, iPhones and Android tablets with no download required. That’s what HTML5 is all about. Apple is one of the finest mobile providers and has innovated much of the technology we now take for granted. Google has built on that with Android by providing a platform that’s more open and thus more suitable to casino apps and the like. In our Android guide, we’ll explain the requirements as well as how to install and configure these casino apps. We’ll even help you set it up so that your mobile device automatically uses your main account and draws from the same bankroll and so forth. One thing all mobile gamers should keep him mind is that these casino use data. Online casino try to limit the amount, but it can add up. If you don’t have unlimited service, you should consider if upgrading makes sense in order to avoid those nasty charges at the end of the month. Even unlimited accounts are subject to throttling, but that isn’t usually a big problem due to the small bandwidth casinos need. Modern casino apps are quite sophisticated. Even if you lose your connection, your gameplay persists. Just reconnect, and continue where you left off. If you need to answer a call or read a text, the casino app can fade into the background and return without issue. Casinos have also made great strides in terms of making these apps more secure and more user-friendly. Another important point is that mobile casino games don’t take up much space, and they’re getting smaller. Consider that the average mobile blackjack game requires just 125 KB! 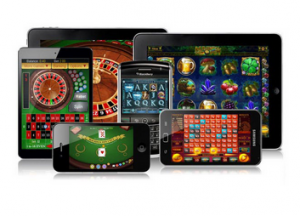 How secure are online casinos for mobile devices? Well, the standards are as high as they are for PC clients. Most mobile casinos use 128-bit SSL encryption, which is the standard on desktop too. It also helps that we only list the best, most secure mobile apps on SlotsClub.com. Any app we list meets our highest standards for security and other criteria, such as new customer bonuses. We also list a lot of diversity so that you can choose an app that suits you whether you use Apple, Android or whatever. The bonuses, which can be as high as $1,000 or higher, are sure to excite you as well! Although Apple takes a more manicured approach, you’ll find most of the same casino options as you will for Android, and you can download these direct from the Apple Store. This is true for iPhones and iPads of all generations. The casinos on Apple are secure, reputable and completely legal. When you win from your Android or Apple device, that amount will be deposited to your preconfigured account, which is the same as on the PC. There’s no need for separate accounts. Just think of the mobile app and the desktop client as two different ways to access the same casino. Some casinos do require you to allocate funds to the mobile casino, but this approach is becoming increasingly rare. If you’re having problems coordinating the desktop and mobile software, never be afraid to contact support. The providers we recommend are always available to assist you. More than 90 percent of all online casinos offer the option to play for real profits from a mobile device. Many do limit that option to Apple and Android devices, but more and more casinos are providing HTML5 interfaces that can’t support anything that runs a web browser. We have more information elsewhere for those who use Blackberry and other devices. Although instant play is becoming the standard, some casinos haven’t yet moved away from Android- and Apple-specific apps. The disadvantage in these cases is that the game selection tends to be smaller than at the main site. SlotsClub.com is the first choice when it comes to information and options related to mobile gaming apps for smartphones and tablets. On our website, you’ll find a broad list of state-of-the-art casinos that offer a wide range of games for your mobile device. These provides all offer real money games. By the way, our site is also mobile-friendly, and you can reach any aspect of it from your phone or tablet. Mobile casinos offer everything from classic slot machines to the latest in video slots. You’ll also find roulette and all of the other table games that have become synonymous with casinos. Even poker is available from many of the best providers. Progressive pots with massive payouts are also an option. Most casinos have moved toward a play anywhere approach, but if a casino has limitations, you’ll be able to see beforehand which games are and aren’t available on the go. Be mindful that many online casino still rely on downloaded apps to provide their services. If an app is available, you should try that since it’s likely to be a well-polished experience. If there is no app or your device isn’t supported, then instant play makes sense. HTML5 allows for smooth play, but apps generally allow for better graphics and features that are more complex. When there is a difference in game selection, the library is usually bigger on the PC than via the mobile app. Even in those cases, there are still hundreds of mobile games that can be accessed around-the-clock. There are also advantages to a smaller, more manicured selection, such as an easier time choosing one to enjoy. Even with smaller selections, modern casinos do a great job of providing something for everyone and enough to keep your interests. Most games can conform to your particular device, and the interfaces are touch-based and tailored to a mobile experience. You generally have the same opportunities to win from a mobile game as you do the PC version. There are, of course, differences across games and providers, but if a slot machine with a progressive jackpot is offered at an online casino, you can expect it to be the same from the mobile casino as well. Despite these similarities, it’s not usual for casinos to streamline the mobile experience. A casino may, for instance, reduce the number of betting options you have from the mobile version. A tablet gives you the advantage of a large screen, but you should to play with the device you’re more comfortable with. Lying in bed is easier with a phone perhaps, and a smartphone is something you can have on your person at all times regardless of where you are. All other factors being equal, most will choose the large screen of the tablet. That added screen real estate makes text easier to read and provides more room for UI elements and whatnot. In the end, it’s a matter of taste. Mobile gambling is quite safe, but in our experience, Android devices are more prone to security breaches than iPhones and iPads. A Windows PC is generally regarded as the safest solution when it comes to playing online casino games. Our tip: play mobile, but make your deposits and withdrawals via the PC whenever possible. Whether PC or mobile, only deposit money with serious casinos. The top casinos have high standards and as well as many protections in place to secure your transactions. Since mobile casinos require the Internet, a stable connection is certainly an advantage. Wi-Fi, WLAN and LTE are generally considered the best in this regard. Data usage should not be underestimated. If you lack unlimited data usage, log into a wireless hotspot whenever possible to save on data.